We all remember those high socked, polo shirts, inactive, gum chewing (I can go on and on) gym teachers who always sat us down prior to our gym class for some stretching. The old-fashioned reach-for-your-toes-and-neck rolls (sorry to my clients reading this because I make them do this too--but for good reason, I’ll get to that). We were always annoyed because it had to be done prior to those awesome kickball gym classes, or those dodgeball-matrix style workouts. Yet, could those 80’s dress down gym teachers actually be on to something? Let’s first take a look at what stretching is in comparison to mobility training, flexibility training, and then see how it all relates to a proper warm up. Stretching is the action of allowing a muscle to be lengthened to its most allowable range of motion. i.e. : Stretching the hamstrings 90 degrees from a lying position is usually the most range of motion individuals can achieve. To stretch we often inhibit other muscles from working to allow for a deeper stretch. This is the Golgi-tendon organ inhibiting other muscle fibers, usually an agonistic one, so the desired targeted muscle can be stretched past it’s normal range of motion. One example of an agonistic muscle is the bicep to triceps’. They are polar opposites of each other. 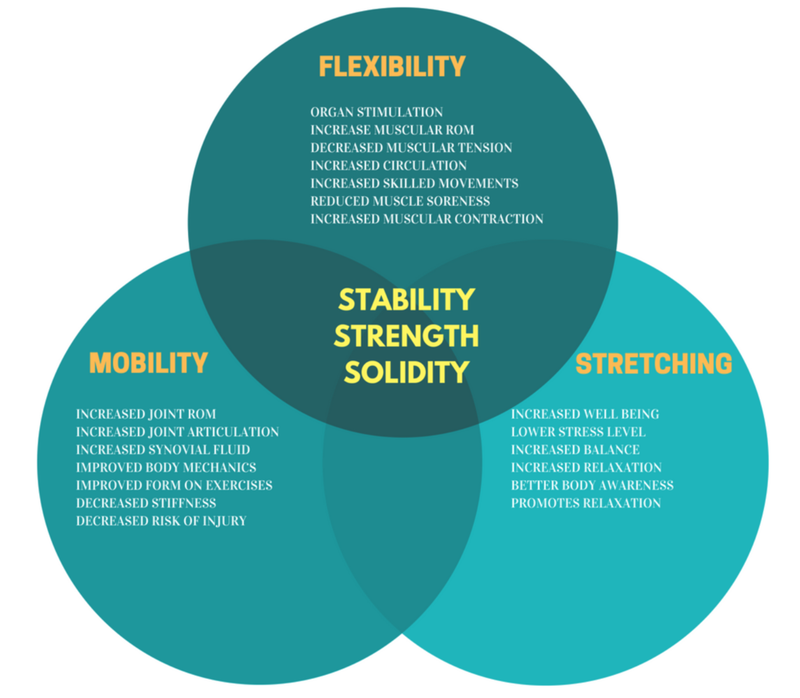 Flexibility training is a training style solely done to maximize muscular ROM, joint ROM, and decrease tension in muscle fibers as a response from the nervous system. Flexibility training can go much deeper as it is also a tool to stimulate organ function, contract nearby organ muscles to increase lymphatic function of the body and also improve cognition as well as mood. Now knowing each one’s properties, we have to determine which one is right for the purpose. Knowing what your purpose is has a great impact on which style of warm-up you should do. Below is a chart breaking down which category you likely fit in based on your goal. For the purpose of this article, we’ll be discussing the importance of utilizing all three methodologies for the minimization of injuries and increase of athletic performance in all capacities. When it comes to training, the optimal way to warm up based on my experience and other science based research, breaks down to static stretching for a specific duration, followed by flexibility training for the muscle groups being targeted during the training session, and lastly a mobility drill to prepare joints and motor control. Static stretching comes first, hitting the main muscle groups being worked such as the hamstrings, quadriceps, and calves, which will induce greater blood flow, a feeling of low muscular tension, and create kinesthetic awareness. The sweet spot as research has found for static stretching seems to be between 20-30 seconds for the purpose of training. Anything above 90 seconds has shown to reduce performance. Afterwards, we will follow that up with flexibility training to further range of motion in muscles so that we can create a greater muscular adaption during the workout. The flexibility should also be done for both the synergistic (working together) and agonistic (working against or disabled through one another) muscles so that the body does not become anterior or posterior dependant during the workout. Finally, we do a mobility drill based on what body parts are being targeted. In this case, the ankles, the knees, the hip, and the spine. The drill will be dynamic which means it is moving instead of static, creating fluid motion in the joints so they are lubricated, but also allowing all possible rotational movements of the joints. With this, your body will be primed in multiple aspects. Those aspects being the motor control of muscle fibers, the nervous system output, its efficiency in firing signals to muscle fibers for contraction. The skeletal system will have an easier time handling heavy loads. Furthermore, the tendons and joints will be in a much more prepared state for the eustress associated with athletic activities. With this approach, 5-10 minutes will be used but it is a well spent few minutes to improve performance, but also increase training longevity. Never go cold turkey into a workout as your chances of injuries skyrocket. After all, training for the long haul is much more important than training without a proper warm up leading to irreversible damage to the body.